Digital Photography School is offering a phenomenal opportunity to learn at the feet of a master. Offered in daily modules, this course is designed to take you from zero to hero in 31 days. Sign up today and save 75%! Enrollment closes August 11, 2017. This course is offered through Digital Photography School and designed by professional photography instructor Jim Hamel. The course costs $49 USD, which is ONLY $1.50 A DAY! So head on over to Digital Photography School and get yourself enrolled today. It May Not Be Diners, Drive-Ins and Dives….. But it IS a tasty treat of Actions, Plug-Ins and Presets! This week only, treat yourself to 40% off award-winning actions, plug-ins and presets from Totally Rad. Save time and money when you use the code RADTREAT40 at checkout. 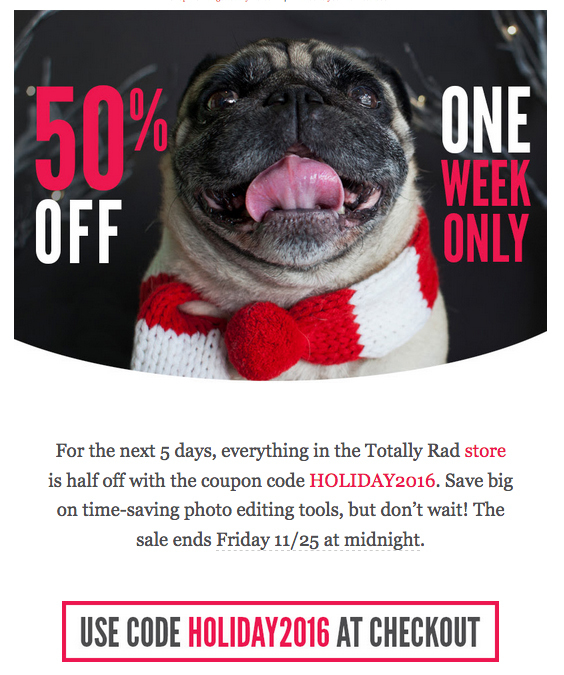 For the next 5 days, everything in the Totally Rad store is half off with the coupon code HOLIDAY2016. Save big on time-saving photo editing tools, but don’t wait! The sale ends Friday 11/25 at midnight. I’m really excited to announce my new brand, Digital Deborah. It combines several of my loves – slurpy lurid color, bold graphic design and interior design – into one awesome package. My work has always been very commercial and I’m thrilled to be able to harness the reach of this wonderful world wide web to blow my own personal dandelion of creativity out into the world. I always like to put my own spin on things. A couple of years ago, out on a location scouting trip for a sign manufacturing company I had been hired by to update their portfolio, I photographed a very large American flag against a stunning blue sky. I uploaded all the images from that day and kept coming back to that flag. It was quite majestic against that deep blue sky. But I wanted something else. Something more…mystical. We see images of our flag all the time. It is everywhere. Ubiquitous. I wanted to create an image that evoked the deeper mysteries of family, tribe and clan. If you’ve ever wanted to buy any of the EXCELLENT products that Doug Boutwell and the Totally Rad team create, NOW is the time. You can save HALF of your money if you act before midnight tonight. And who doesn’t want to keep more money in their pocket? Read my reviews of Replichrome I, RadLab, and their original set of Lightroom Presets. The Year was 1987 B.D. That was the year I started my first little photography studio. 1985 B.D. Before Digital. Those were the days of film. Those were also the days of shooting and tensely waiting, sometimes for several days, to find out if anything you shot was worth keeping. Which is why I gave up on wedding photography fairly early on. Entirely too much stress. I started out shooting with a basic Nikon SLR with a single kit lens. As I became more financially flush, I moved on to a Bronica medium format camera and stepped up to bigger negatives. Because I always wanted to be a commercial photographer, I focused on finding films that would give me the fine-grained, higher contrast, punchy color I was looking for. I continued to use those same films to photograph my portrait customers, as well as products, objects and architectural details. I’ve been studying images for longer than….well, a long time, dammit. Just take my word for it. Whenever I pick up a glossy magazine or a music CD or even a movie poster, I try to figure out how it was lit. I study catch lights the way some people study baseball stats. It’s nice to know I’m not the only fool geek nerd photography lighting aficionado out there. Annie Leibovitz, Jill Greenberg, Patrick Ecclesine, Dave Hill and others laid bare. Check out It’s All in the Lighting, Baby! by Melanie Mann, a photography assistant to the pros out in L.A. This is a fantastic blog post, replete with awesome diagrams and behind the scenes videos.